Remove leaves from bok choy; thinly slice leaves to make 2 1/2 cups. Cut bok choy stalk into 1-inch slices to make 1 1/2 cups. Set aside. In 5-quart Dutch oven, cook noodles as directed on package. Drain, reserving 1/4 cup cooking water. Return noodles to Dutch oven. Add 3 teaspoons of the sesame oil; toss to coat. Cover to keep warm. Meanwhile, in wok or 12-inch nonstick skillet, heat canola oil over high heat. Cook and stir onion, gingerroot and sliced bok choy in oil 1 minute. Add shrimp and pea pods; cook and stir 1 to 2 minutes or until shrimp start to turn pink. Stir in bok choy leaves, stir-fry sauce and reserved cooking water. 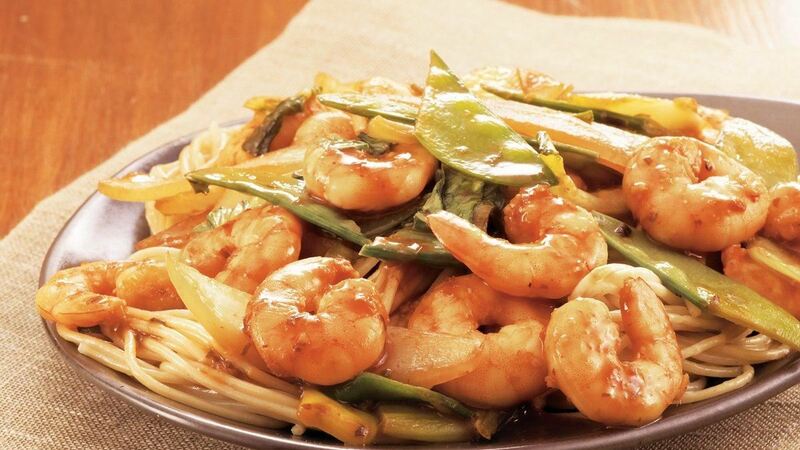 Heat to boiling; cook 1 to 2 minutes or until shrimp are pink and vegetables are crisp-tender. Stir in remaining 2 teaspoons sesame oil. Serve with noodles.